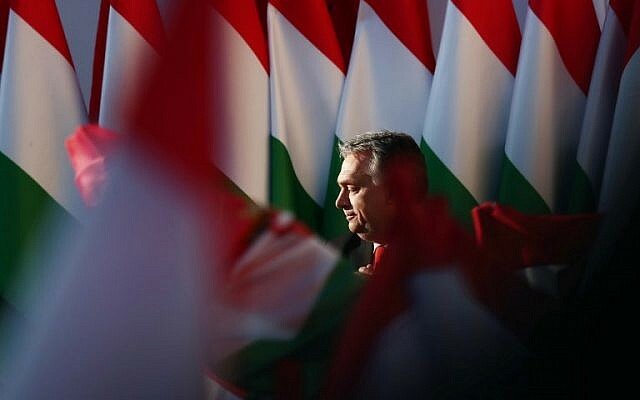 BUDAPEST, Hungary (AFP) — Hungarians will head to the polls Sunday in an election being keenly observed across Europe to see whether firebrand nationalist Prime Minister Viktor Orban will win an expected third term. Polling stations will open at 6 a.m. local time (0400 GMT) and will close at 7 p.m. local time. Opinion polls have consistently put Orban and his right-wing Fidesz party 20 or more points clear of their nearest rivals, Jobbik, a far-right party that has been moving toward the center, which in turn has been a few points ahead of the center-left Socialists. A mainly first-past-the-post election system designed by Fidesz also gives it an edge over a divided opposition but a high turnout and anti-Fidesz tactical voting could add an element of unpredictability. Even if Fidesz does gain its expected majority in the 199-seat parliament, analysts will be watching to see whether it falls short of the two-thirds “supermajority” that has enabled it to pass some of its most far-reaching and controversial bills. These include some of the measures that have put Orban on a collision course with Brussels, such as eroding the independence of the media and the judiciary, as well as its crackdown on civil society groups, particularly those funded by Hungarian-born US billionaire George Soros. The government has been accused by critics of using anti-Semitic stereotypes in its relentless campaign against Soros, who is Jewish. Orban accuses Soros and the organizations he funds of promoting mass Muslim and African immigration into Europe in order to undermine its Christian identity. Orban’s sometimes lurid rhetoric against immigrants resulted in February in a spat between the government and the UN’s top human rights official, Zeid Ra’ad Al Hussein, who accused Orban of xenophobia and racism. Although Orban’s actions, including refusing to participate in the EU’s refugee resettlement scheme, have sometimes annoyed other European governments, Fidesz is afforded a measure of protection by virtue of its membership of the main center-right EPP grouping in the European Parliament. Senior EPP leaders have themselves courted controversy by wishing Orban luck ahead of the poll. On a visit to Budapest Friday, Jaroslaw Kaczynski, leader of Poland’s governing PiS party, also gave Orban his endorsement. Poland’s government has had its own run-ins with Brussels over its changes to the judicial system, and sees Hungary as an important ally within the EU. A strong showing for Orban will be welcomed by admirers on the far-right in Europe, such as France’s Marine Le Pen, and beyond. Orban has also cultivated Russian President Vladimir Putin as an ally and has previously cited Russia as an example of the sort of “illiberal state” he hopes to anchor in Hungary. Turnout will be a key factor in determining the result, with higher participation thought to benefit the opposition. At a local mayoral by-election in February, Fidesz suffered a shock defeat after the opposition threw its weight behind a single candidate, prompting a surge in turnout. The last few weeks of the campaign have been marked by allegations of money laundering and corruption leveled at Orban’s inner circle, often published in media owned by oligarch Lajos Simicska, an erstwhile Orban ally who fell out with him after Fidesz’s 2014 election victory. Orban has avoided public debates with opponents or speaking to independent media, preferring instead to address supporters at carefully stage-managed events where he has hammered home his anti-immigration message.